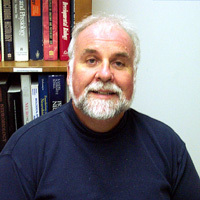 Dr. George Taylor received his Ph.D. from the University of New Mexico in Animal Psychology and his post-doctoral work was at Rockefeller University in New York City in Neurophysiology. He has also held appointments as a guest scientist in France at Bordeaux Medical University in neuroendocrinology, at the German Cancer Research Center–Heidelberg in experimental pathology, and Tokyo University in biology. Research in Dr. Taylor's laboratory, staffed by a dozen graduate students and undergraduate research assistants, employs behavioral biology animal models for the study of neuroendocrinology–psychopathology relations. Ongoing projects include neurosteroidal influences on cognition and sociosexual behaviors, steroid receptor binding in the hippocampus, chronic mild stress and depression and hormones as neuroprotective agents in stroke, and other forms of traumatic brain injury. His lab collaborates with colleagues at Heidelberg University Medical School and Washington University Medical School, allowing his graduate students to gain further research experiences in biomedical settings.